The former Oasis star follows in the footsteps of acts such as the Clash, Paul Weller and New Order in collecting the award. He will takes the prize as his old rivals Blur pick up this year's outstanding contribution to music prize at the Brit Awards next month. Noel already has the Brits title under his belt, taking it in 2007 as a member of Oasis. The guitarist, who launched his solo career fronting his High Flying Birds in 2011, will pick up his Godlike Genius prize at the NME Awards on February 29 at London's O2 Academy Brixton. Noel joked: "I would like to thank NME for bestowing upon me such a great accolade. I have dreamt of this moment since I was 43 years old. NME editor Krissi Murison says: "For the best part of two decades, the voice of one man has dominated the pages of NME more than any other. That man is Noel Gallagher. "Opinionated, intelligent, passionate and always hilarious - Noel walks and talks it better than any other musician out there, and it's just one of the reasons why the British public loves him so dearly." Noel was behind years of Oasis hits including chart-toppers such as Don't Look Back In Anger, Some Might Say and Go Let It Out. He quit the band in 2009 after finally tiring of working with his brother Liam, and has gone on to have a number one solo album. 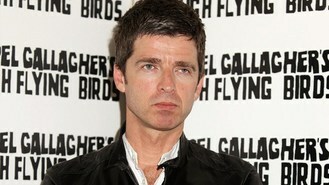 Murison added: "No individual has written as many sing-out-loud classics as Noel. His songwriting has defined a generation."